https://tamarabakx.blogspot.nl/2016/10/vikings-month-of-history.html Before I start I had some problems with my phone so my notebook didn't save my notes. Unfortunately, I can't recall everything from the day. So sorry if I forgot something or that my photos are bad. 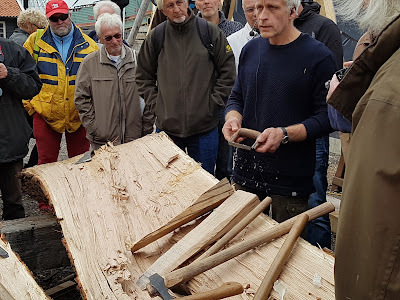 I had to come early and see the preparations from Thomas Finderup for the afternoon chop/splitting and carving reading so there were only a few persons on the Bataviawerf. 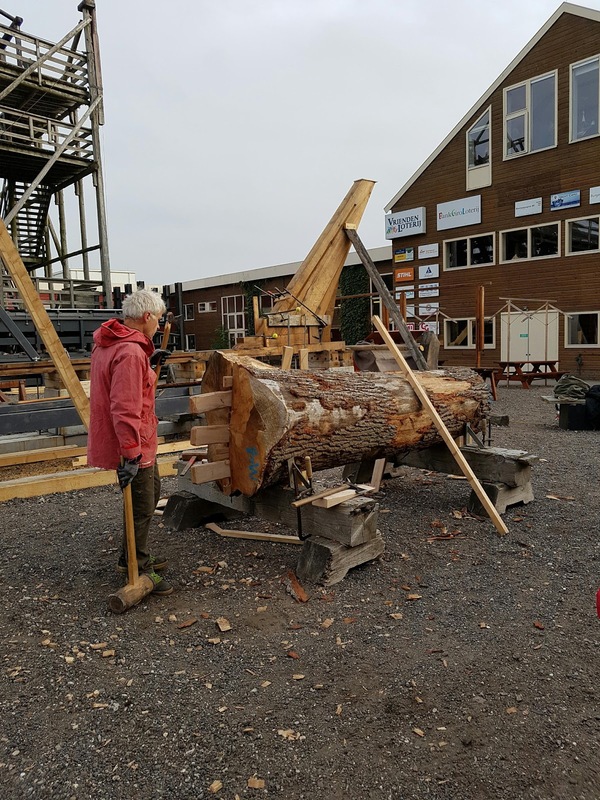 After his preparations, I went to see the different aspects that you have on a ship like the sails and the woodwork maker. That was before I started a guided tour. A guided tour is the opportunity to ask your questions and can take up to two and a half hours and you could choose to leave when you like. As the tour started I had one and a half hour before the symposium started so I didn´t do the guided tour maybe next time. I got distracted a lot during that tour although I choose to go on an English tour instead of the Dutch tour, not because of the guide. When we visit the `Batavia`I lost my concentration completely. The ´Batavia` a 17th-century ship with amazing woodwork and was able to see how detailed everything was. I listened to the guide but actually I wanted to explore and find out myself. Although I was able to do that I was thinking about the boatbuilding of the Vikings when the guide told some part of the ship is a construction invented by the Vikings. My distraction was gone immediately I heard the word Vikings and the concentration follow the guide was completely there again. After my lunch, the symposium started I got seated next to the team of the 'Kamper Kogge' and they are also responsible for lifting the wrecked ship the 'IJssel Kogge' at first when they had lifted the wrecked ship I thought it was a Viking ship. It has the same plank structure on the outside as a Viking ship. But unfortunately, it isn't. They haven't found a Viking shipwreck in The Netherlands just yet. The readings are very interesting and learned a lot about preserving methods and reconstructions. How they do it but also if you can imagine what the difference is in 2016 they only build a ship in a couple of months until 2 years depends on what kind of ship they construct from history in The Netherlands. In the Viking time, it would take years to build such a fleet to go to Paris, even if they had enough people it would take about 2 till 5 years to build only one ship. So when they concur other ships they could use that to get a greater fleet. They always have used mythology on the ships. That is how they recognized from which country you came from. 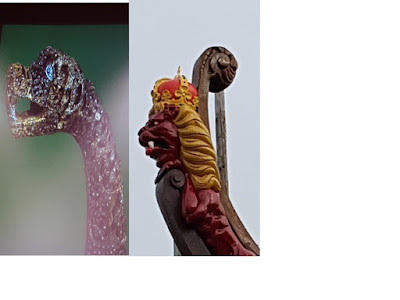 That is how they recognize the Vikings because they used the same front and back on the boat with different mythology themes. In front always an animal like a dragon, it depends on the country mythology, under the dragon, there was some mythology. 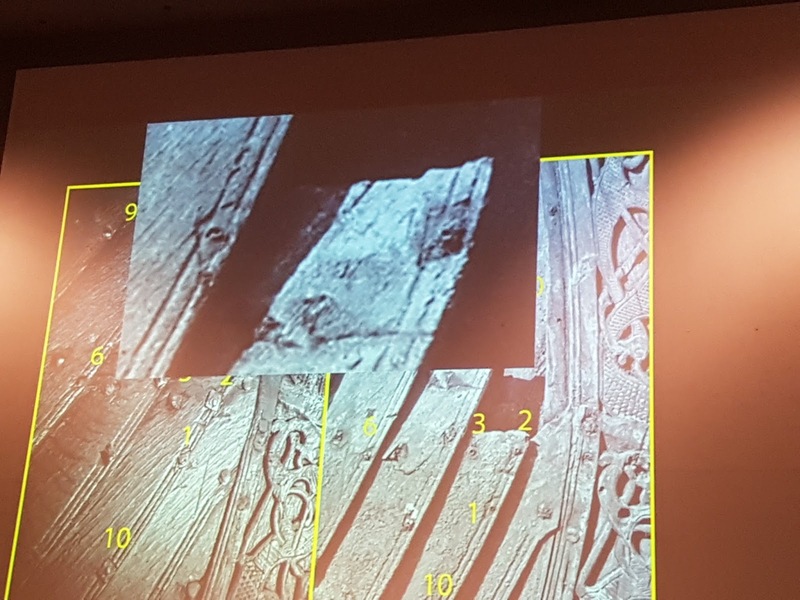 He also talked about the 'Oseberg' they found it almost completely on a burial site. On that burial site, they found the tools to make a ship it could be a warrior as well because of the axes they found. They found multiple on multiple sides. He also talked about the ritual that comes with a Vikings dead and how amazed they really where to find a lot of boats intact while they knew that a Viking boat were burned with the dead in it. They also find two warrior women on one of the sides. They had a lot of axes and tools to make weapons. 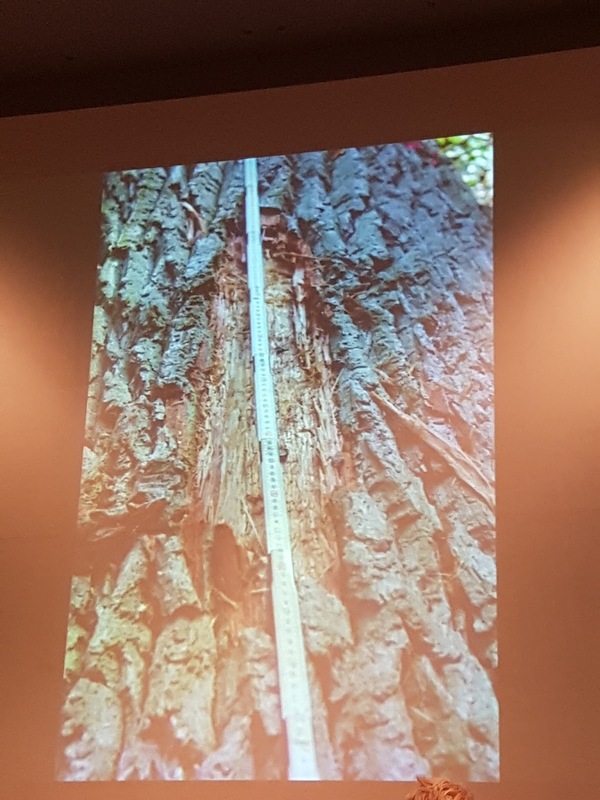 After the talk, we went outside to split and chop a tree and get different demos with different axes. 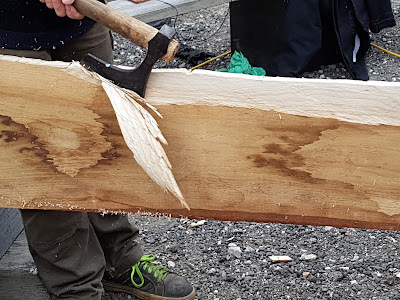 He also told how they made planks for the boat. When finding oak wood they use frames on the tree to find fitting wood for a boat. 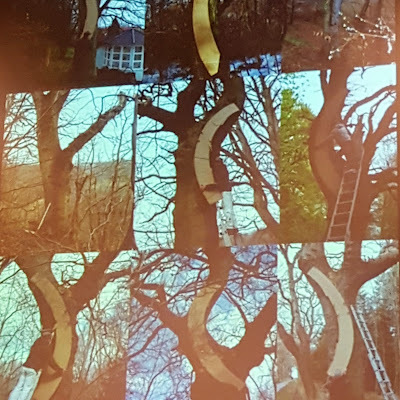 Those frames used to cut the tree as economic as possible. They burn or steam the wood in the right positions. 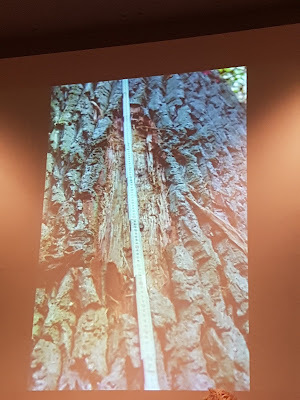 Did you know they only need to get rid of the bark to see if the tree was good enough for preserving, without disease, and if the wood was hard enough to build a boat? I needed to think about Ragnar when he introduced Bjorn to Floki where we see exactly the same thing happen. The presentation I needed to think about Floki and how we see him as boat builder and warrior. If the burial was from Floki it would look like the same as Thomas Finderup told us.The part of the mythology I liked as well. 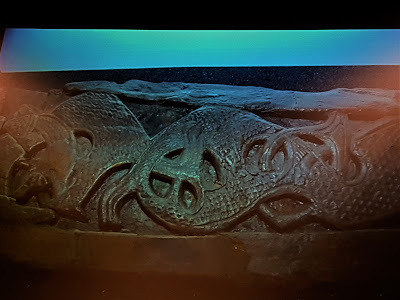 There are a few stories about boats in Norse mythology Naglfar is also used in the presentation a ship that exists only of toe and fingernails. The other ones are Hringhorni, Skíðblaðnir and Sessrúmnir.